If you’re looking to buy the best white shirt, you’ve come to the right place. In this article, we’ll take you through the tailoring features you need to pay attention to and also explain, in simple terms, the different jargon and terminologies used to describe button-down white shirts. We’ve also listed our pick of best white shirts for men in 2018. How long should a white shirt last? White Shirts are the staple of any man’s wardrobe. Perfect for both formal and casual occasions. However, being white, they’re difficult to keep looking fresh. A good white shirt, that’s worn regularly, should last roughly 12 months. However, there are many different factors that contribute to a white shirt’s life cycle. A simple rule is the more you wear it, the faster it will start to look tired. Most food stains will come out after a good wash or service with a professional dry cleaner. The main reason that causes white shirts to turn is a build up of dirt and sweat stains over time, which are impossible to remove. 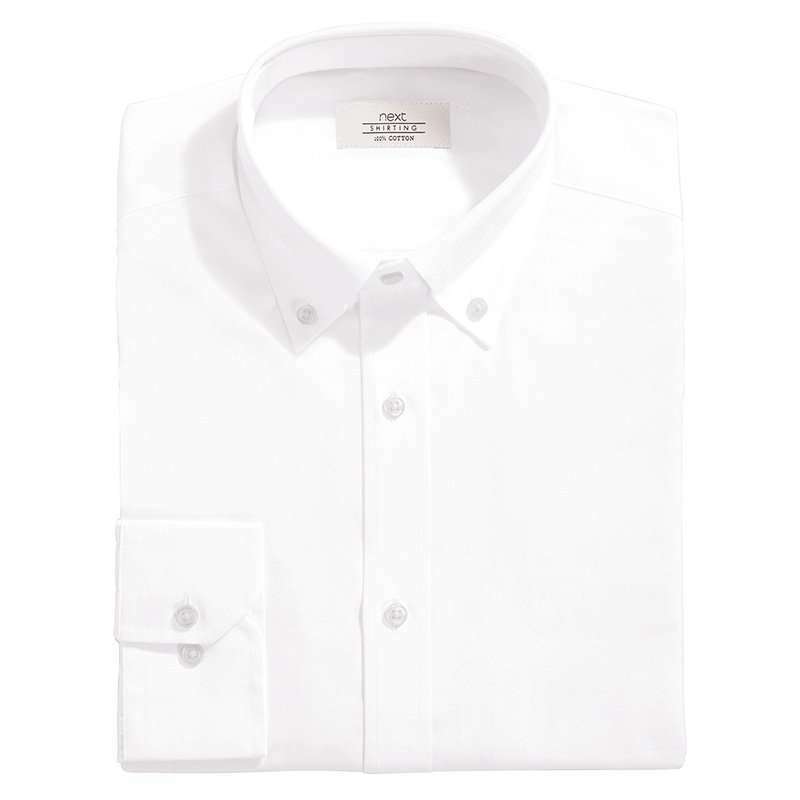 A regularly-worn white shirt, like any garment, will also stay to fray at the cuffs or elbows after time. See also: Best Home IPL Hair Removal Machines 2018. An ill-fitting collar is the number one sign of a cheap/poor shirt. The right collar choice is, like any item of clothing, dependant on occasion. 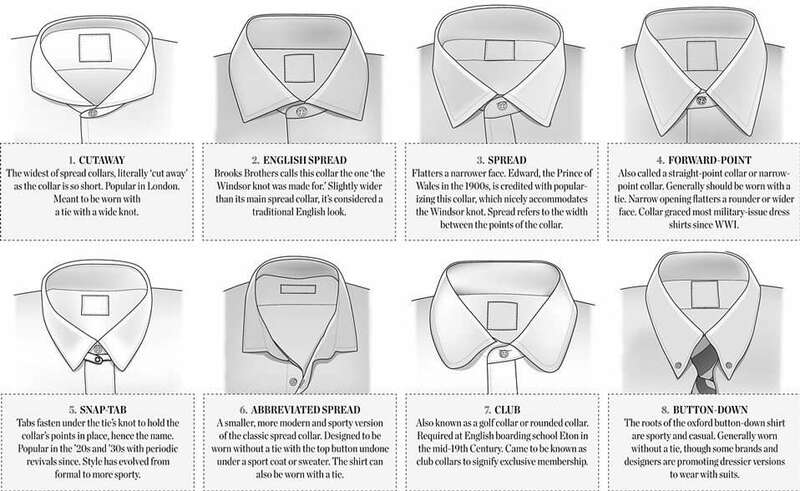 Below is an easy-to-follow guide that details all the different collars you’ll likely to come across. Collar: If you need to wear a tie with your white shirt, then you should avoid buttoned (Oxford shirt) collars.Wearing a tie with a buttoned-down collar looks clumsy and forced. Instead, you should focus your energy on how severe you want your collar angle (cutaway) to be. There are three collar types you should consider here. Regular, semi cutaway and full cutaway. As a general rule, the bigger the knot you plan to tie, the wider the cutaway should be. A full cutaway collar is complemented by a Windsor knot, for example, whereas a tradition knot looks good with a regular or semi cutaway collar. If you don’t need to wear a tie, then a button-down Oxford shirt is a good versatile alternative that will pass as formal when paired with a blazer. However, if the occasion is closer to formal than it is casual we suggest avoiding a button down collar. Button collar (Oxford): A white button-down Oxford-style shirt, for example, is great for more casual occasions where a tie isn’t required. However, a button-down collar rarely works with a tie. Cuffs are less clearcut than collars. Buttoned cuffs look great with or without a jacket, whereas double cuffs (also called French cuffs) can look a little heavy or overly formal once a jacket is removed. As a rule, we suggest buying buttoned cuffs for casual or work wear, reserving double cuffs for formal events such as black tie events or weddings. That said, if you’re not a member of the wedding party then personal preference, between wearing buttons or cufflinks, is fine. What type of cuffs should I wear? Buttoned (barrel) Cuffs: The is the most popular type of cuff. Button cuffs come in with a couple style variants, all of which are there for personal preference and have no bearing on the formality of the shirt. Typically, this are squared or angled corners. The other option is how many buttons you want. Two is traditional; three is an option for when you want to look a little more dressy. Double (French) Cuffs: The double cuff is where the cuff is elongated and designed to be worn doubled back and fasted together with cufflinks. Double cuffs are traditionally more formal than buttoned cuffs and, as therefore, should be reserved for such occasions. The double cuff is better-suited for showing a little shirt underneath your jacket. Like the button cuff, double cuffs can have squared or rounded corners – it’s personal preference. Turnback Cuff: Debuted by Jermyn Street tailor Turnbull & Asser and made famous by James Bond (Sean Connery) in Dr No. Turnback cuffs are a combination of the double cuff style with the ease of buttons. Single cuff (with cufflinks): The most formal of all, and reserved solely for white tie events, are single cuffs with links. Buy this shirt from Hugo Boss. Buy this shirt from T.M.Lewin. A little more expensive than rivals Charles Tyrwhitt (below), but a still competitive when bought in bulks of four. This shirt is made from pure wool that’s soft and breathable, it’s given a ‘special fabric coating’ too, which T.M.Lewin claims will prevent the shirt from creasing, even after machine washing. 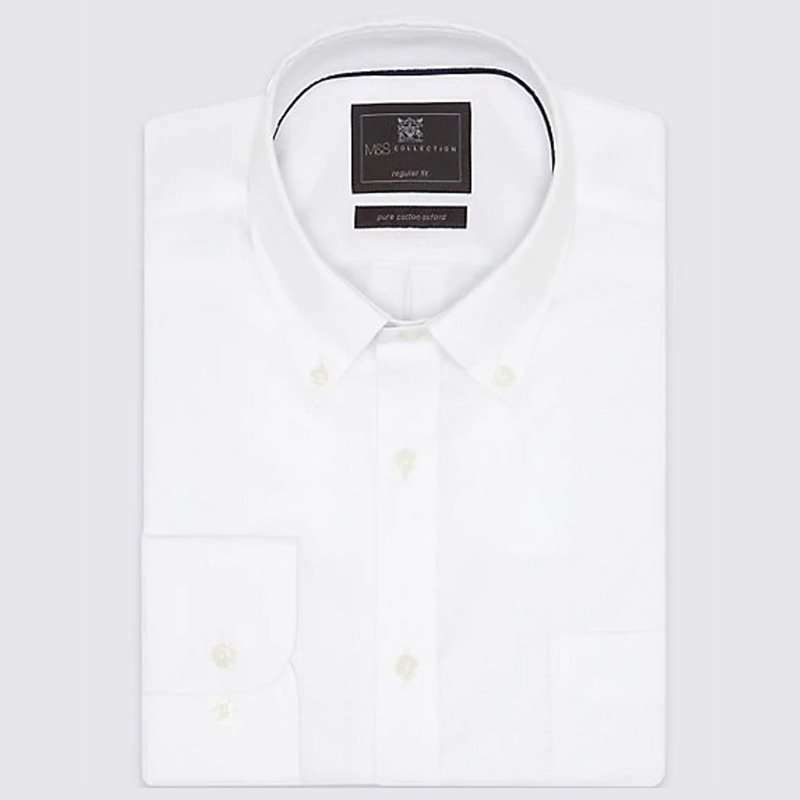 The featured shirt is a button cuff with a classic collar, however, the site offers shirts with different collars and cuffs at similar prices. We suggest you take a browse. Buy this shirt from Charles Tyrwhitt. Charles Tyrwhitt has been making quality shirts in the UK for generations. Today is no different. 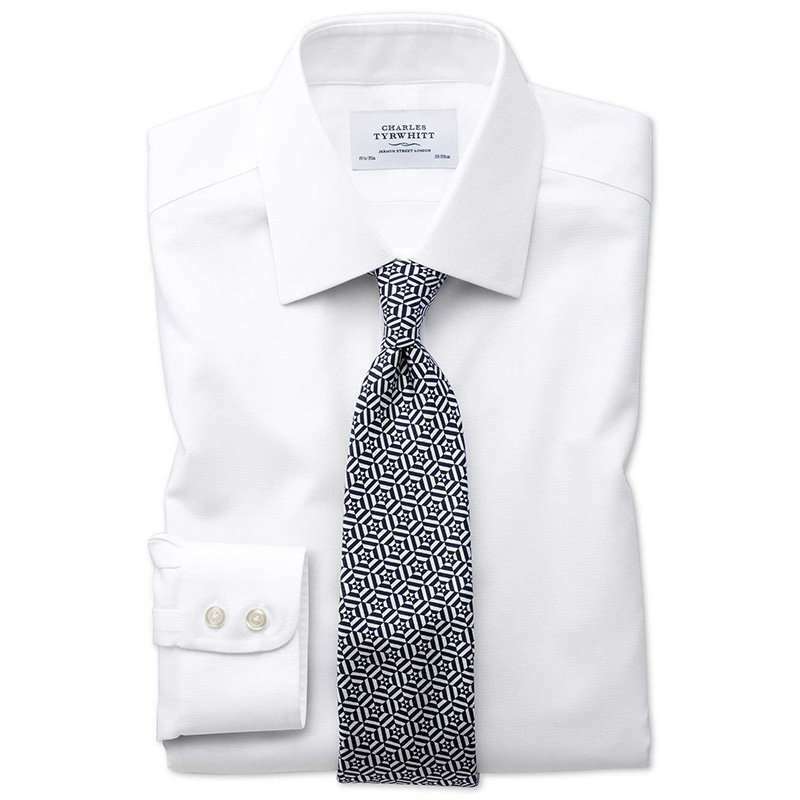 This is the standard 100% cotton; non-iron; classic fit; classic collar; white shirt. It comes with a six-month quality guarantee and can be personalised to your taste with pockets of a monogram from £6.95. Customers can choose whether they want single- or double-cuffed shirts at no extra price. For extra £8.95 customers can also tailor the length of sleeve they want. 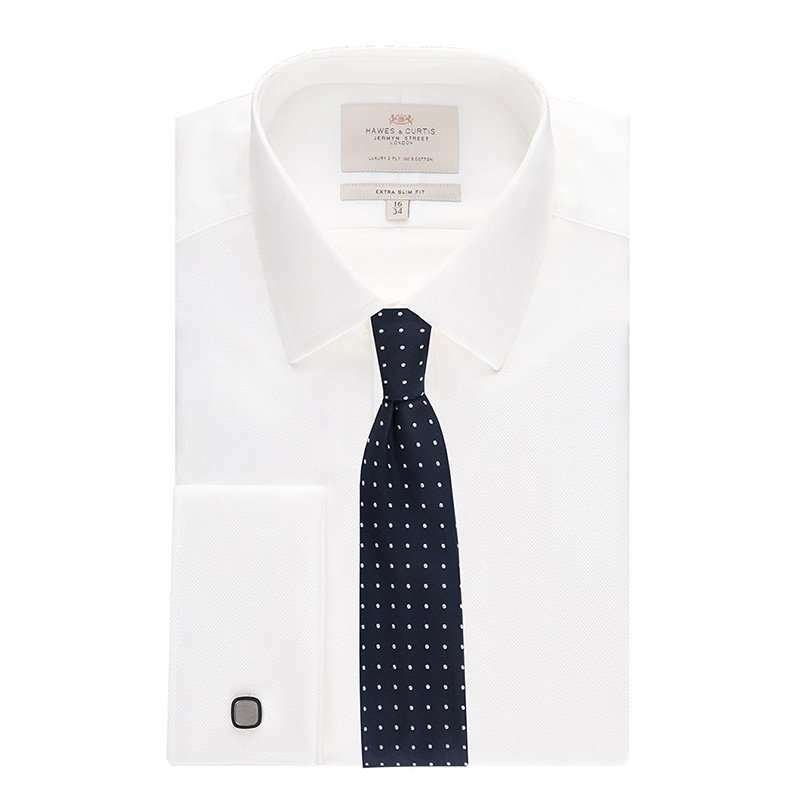 At £19.95 it’s a great option for a versatile white shirt and is priced very competitively. Buy this shirt from Next. Perfect for less formal occasions, the Oxford shirt is a classic cut that can be worn, with style, almost anywhere. This shirt from Next is 100% cotton and comes in either regular or slim fit cuts. This oxford shirt will look great when paired with a jumper, jacket, or simply on its own. At £22 it’s a bargain and is an essential part of any man’s wardrobe. Buy this shirt from Hawes & Curtis. 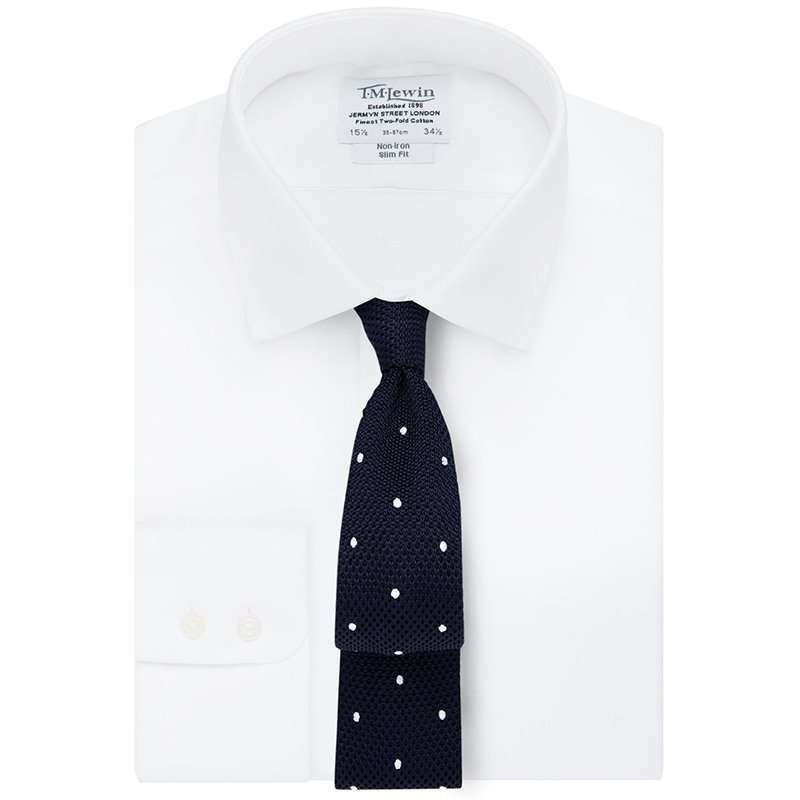 Crafted from luxurious 2 ply 100s cotton, this is a fantastic white shirt at an even better price. This is H&C’s extra slim fit white shirt, meaning it will hug the body more than a regular or slim fit shirt to create the sleekest silhouette. It also features double cuffs and a semi cutaway collar, making it perfect for formal occasions such as black tie events or weddings. Buy this shirt from M&S. The oxford shirt is a great button-down collared option for more casual wear. Oxford shirts are versatile option sitting neatly between too formal and too casual. This offering from M&S is better suited to customers who need a larger fit. M&S offers this shirt in regular sizes, plus a new ‘Big and Tall’ fit to cater to a wider range. It’s 100% cotton and can be machine washed at home at 30°. Read next: Best Treadmills 2018: The 8 BEST running machines for home.